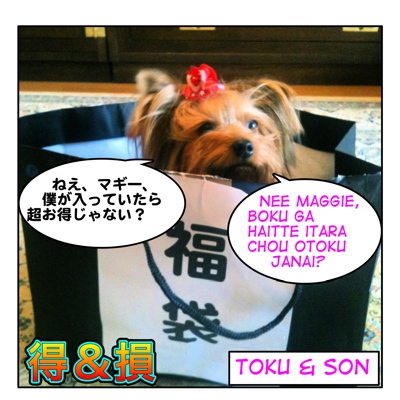 = Nee Maggie, boku ga haitte itara chou otoku janai? = Hey Maggie, wouldn’t it be a great deal if I were in your “lucky bag”? Hi everyone! Did you have nice winter holidays? We will start with something cultural today. In Japan many stores and restaurants are closed on January 1st. (Most companies are closed on January 1st, 2nd and third as well.) But big stores and department stores open on January 2nd or 3rd for a New Year’s sale. People rush to the department stores to buy the 福袋 = fukubukuro of their favorite stores. So the stores stuff various random contents in a bag and sell them as 福袋 ( = fukubukuro) on January 1st ~ 3rd (→until they are sold out. ) They should contains articles worth much more than the price of the bag. The popular one will be sold out immediately and people stand in line from early in the morning in order to get the limited number of lucky bags. The bags are sealed so you can’t peek inside but you are supposed to get much more than you paid for. But recently many stores have started showing the contents of the bag so that customers don’t waste money for something they don’t need. I would love to see inside the bags but at the same time, it’s more fun to open the bag in you don’t know what’s inside. 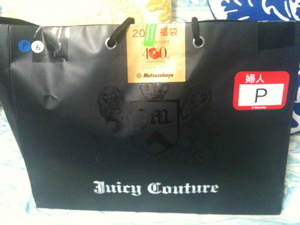 I got one designer brand “lucky bag “this year. It cost 20,000 yen and according to the shop clerk, it is worth 100,000 yen. Really??? The pink camisole has ¥35,000 price tag…So as they said it actually had ¥100,000 value clothes in it. I think it is a great idea for both the stores and the customers. Customers can get stuff much cheaper than usual and stores can get rid of winter items before spring comes and/or attract more customers by selling those 福袋 ( = fukubukuro ) = lucky bags. 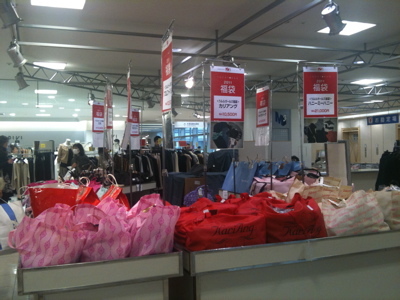 Every year, we see news clips that says some department sell lavish福袋 ( = fukubukuro). Some extreme one costs more than 1 million yen up to 27 million yen. What’s in it? It depends on a year but for example a car, luxurious cruise, air tickets, gold, jewelry, fur coat, etc. = Biiru sanbon kattara koura wo ippon omakeshitemoratta. = I bought three beers and they gave me a bottle of Coke as a gift. 得しちゃった！ = Toku shichatta. 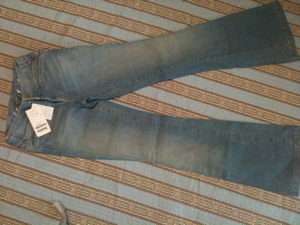 = I am so lucky!/ I saved money. = Nenmatsu ni katta fuku ga shougatsu ake ni seiru de hangaku de urarete ita. 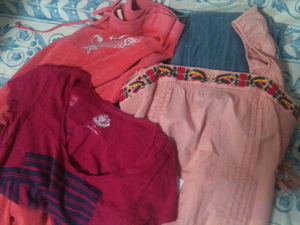 = They were selling the clothes I bought at the end of the year at half-off in New Year’s sale. = Ichiman yen mo son wo shita. = That’s 10,000 yen loss for me. Ex. 株で大損(を)した。 = Kabu de oozon (wo) shita. = I lost a lot of money on the stock market. We see/ hear this word everywhere when we go shopping. = Ima kau to otoku! = Buy now so that you can save a lot of money. = Matomete katta hou ga otoku desu! = You will save money if you buy in bulk. = Kochira wa taihen otoku na okaimono desuyo. = This is a great bargain. = Kaiin ni natta hou ga otoku desu. = If you become a member, you can save money. →You can get a better deal if you become a member. Not just money but also we use 損 ( = son) and 得 ( = toku) when you talk about advantages, disadvantages or luck. = Kyoudai ga ooi kara chounan nante itsumo son bakari shiteiru. = Since I have many brothers, it is always disadvantage to be the oldest son. = Ano kaisha dewa josei ga son wo shiteiru. = The female workers at that company are at a disadvantage. = Sonna koto wo shitemo nanno toku nimo naranai. = There is no advantage in doing such a thing. = Pretty girls get advantages. = Hayaoki wa sanmon no toku. or The early bird catches the worm. = Shinpai shite son shita! = I worried about nothing. = have to get one’s money’s worth from something. = Baikingu dakara ippai tabenakucha son dayo! = Karaoke dewa ippai utatte tanoshimanakya son! = Nani mo osake wo nomanakatta noni warikan nannte nanka son shita kibun da. = Although I didn’t drink alcohol at all, we ended up splitting the bill. (I feel like I have lost money) →That is not fair. = Ekonomii kurasu ga ippai de bijinesu kurasu ni appu gureido shite moracchatta. Sugoku toku shita kibun! = Since economy class was full, I got my seat upgraded to business class. I am so lucky! = To think about something without calculating profit and loss. = Maggie wa tokuna seikaku dayone. Nanimo iwanakutemo minna ga tetsudatte kureru kara. = Maggie is very lucky. (She doesn’t have to make any effort to ask anybody for help.) Everybody just helps her without asking them. = Kare wa sonna seikaku dakara iya to ienai de hoka no hito no shgioto wo yaru hame ni naru. = Because of his weak personality, he can’t say “No” (to others ) and he ends up doing other people’s job. = Bucchake anta ga haitte iruyorimo neko ga haitte ita hou ga ureshiiwa! = To be honest, I would prefer to have a cat in a bag to you. Thank you!!! I fixed it! Haha! Thank you! I fixed it. 売 means “to sell” but its on reading is bai = “buy”. I didn’t realized it until now.